I’ve been a writer for a long, long time. I’ve written something every day for around 30 years now. I’ve been a content marketer since 2004, even though we didn’t call it that back then. These days, I’m a Chief Content Officer — a job title that didn’t exist just a few years ago. I love and respect writers, and I know a lot of them. Some are successful; some are struggling. And I have some thoughts on what can make the difference. You may know that we run a program to certify excellent writers as Certified Content Marketers. What does that mean? 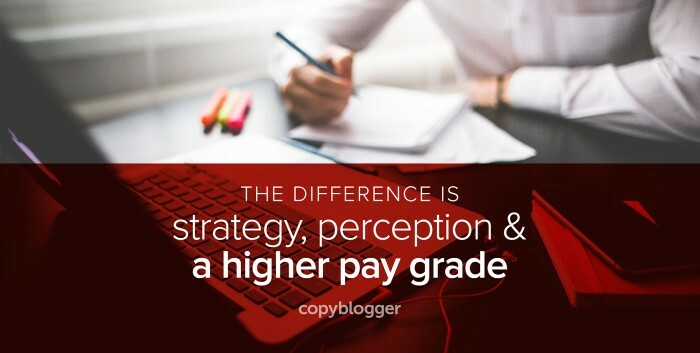 What’s the difference between a good writer and a good content marketer? But first things first: What is this content marketing thing, anyway? Content marketing is the strategic creation of text, imagery, audio, or video that delivers a relevant, interesting message to a customer or prospect, while at the same time paving the way for a sale. Good content requires excellent writing. But the elements of strategy and structure need to be in place to get it to work as marketing. Which is, after all, what we get paid for. So, here are five elements that separate high-quality content marketing from material that’s well-written but might not deliver the same business value. You may have noticed that at Copyblogger, we often talk about audience, rather than prospects or leads per se. The audience is made of people at many stages, including those who aren’t in the market for what you do or what your company does, but can spread the word about your content. And audiences don’t stick around for weak commercials or carbon-copy content. They need to be moved. If your content doesn’t do it, they’ll go elsewhere. It’s a big web out there, full of delicious distraction to tempt them away. This is where your art comes into play. If you want to take your marketing writing to another level, consider working on plays, screenplays, fiction, or poetry. Anything creative designed to create an emotional response will improve your professional work. And yes, you can move your audience even if your topic is “boring.” Use humor, stories, or frustration. Everything we do as people creates mini stories — you can use those for content, even for technical topics like law, medicine, manufacturing, or accounting. You are never entitled to the attention of your audience. You have to earn that attention every day. Among your clients and employers, you may find that founders and CEOs can have a tough time with this. They often assume their businesses are riveting. It’s your job to help them see that the audience doesn’t have the same passion for the business that they do. If your content isn’t successful, if it isn’t gaining attention — it might not be good enough. You may need to put in more work — find better angles, craft better headlines, and find the right tone and voice for that particular audience. How can we tell if our content is worth consuming? If people consume and feel driven to share it. If it works for your audience, it works. The biggest problem I see with content is cookie-cutter, paint-by-numbers stuff. Our Certified Content Marketer training program teaches you structure and formula, but it’s your job to find the spark. If you’re writing for a company, somewhere in your organization is someone with a passion. It might be the founder or a salesperson or a support person. Someone cares desperately and can show you where the spark is. And if you can’t find anyone … you need to look for another company! I don’t say that flippantly. Companies without G.A.S. don’t tend to last long. And even if they do, they’re no fun to work with. As a professional writer, you are the scribe of the business you serve. It’s your role to take their beliefs and passions and give them a voice. I take this very seriously, and I think you should, too. Be part of everything. Be curious about everything. Become a lifelong student of everything. It’s all material. There are structures that have been shown to work better, because they make your ideas easier to perceive and understand. Here’s a nutshell structure for effective content. 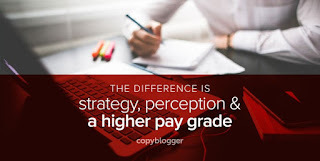 Copyblogger has lots of posts on these points, and of course we also cover them in depth in the Certified Content Marketer training progra. You may be more than able to handle everything above — but you also need to convey that to your clients or employers. A successful content marketer knows how to market her own business, as well as her clients’ or employers’ businesses. Let’s face it. You aren’t going to find the perfect gig that will keep your bills paid and your brain happy forever. It’s not how the world works anymore. You need to position yourself for today and for tomorrow. You need to market yourself as the smartest, best solution. You need to take all of the authority and technique that you use for your clients and treat yourself as your most important client. That doesn’t always come naturally to us, but it can be taught — and when you learn it, you will appreciate the benefits. At Copyblogger, we love writers. We respect writers. And we want writers to be paid what they’re worth. You run the show. The web revolves around words — and you are the creator of those words. We want you to get the respect (and pay) you deserve. #DIGITAL: What’s the Difference Between a Professional Writer and a Content Marketer?